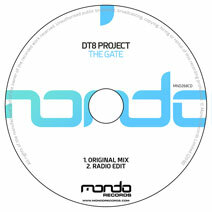 Continuing our strong start to 2018, Mondo Records is proud to present the latest release from DT8 Project (aka Darren Tate) titled 'The Gate'. Darren of course is no stranger to crafting timeless trance masterpieces, everything from 'Destination', 'The Sun Is Shining', 'Hold Me Till The End' and 'Winter' to 2016's entry 'Let it Go'. Under his DT8 Project moniker, Darren has amassed a huge following and respect for crafting those seminal trance moments. The latest entry from DT8 Project is the spellbinding sounds of 'The Gate'. Taken from the forthcoming new DT8 Project album, this is a little taster of what is to come. 'The Gate' will certainly please the army of DT8 Project fans thanks to yet another lush melody, soothing, warm pads and a sublime string fuelled break. Expect more from DT8 Project in the coming months, but boy are we glad DT8 project are back!